The famous German maker of PSUs and cooling solutions Be Quiet! has unveiled the new SilentWings 3 case fans. The new fans come with a revised design that offers even more performance than their predecessors and a simpler installation procedure. The new case fans expand the range of uses. They feature seven revised and optimized fan blades for excellent airflow. The funnel-shaped design of the rubberized frame allows greatly increased throughput. 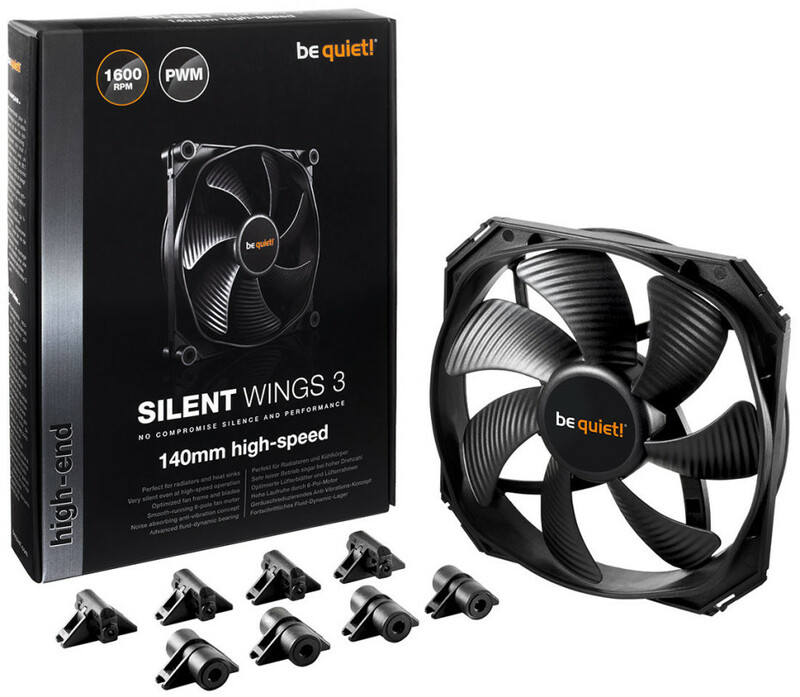 These improvements result in an extremely high static pressure, which makes the SilentWings 3 the perfect fan for radiators, heatsinks, and computer cases. There are two models as of now with diameters of 120 mm and 140 mm. Both of them are exceptionally quiet – the 120 mm model makes just 16.4 dB of noise while the larger one is even quieter at 15.5 dB. The highly efficient, three-phase 6-pole fan motor and the rubberized frame contribute positively to this: both parts reduce vibrations to a possible minimum. In addition, the advanced, high-quality IC motor control effectively prevents electrical interference. The fans also come with a new installation system that allows users to mount the fans on coolers, radiators and fan mounts in PC cases. Thanks to the usage of an advanced fluid-dynamic bearing with a brass core the SilentWings 3 fans can last 300 000 hours. This applies to all four variants of the two available sizes (120 and 140 millimeters): be quiet! offers the SilentWings 3 in a 3-pin and PWM variant, and these are both also available as High-Speed editions. The new Be Quiet! fans are available now. They sell for USD 21.90/GBP 18.99/EUR 22.50 for the 120 mm version, while the 140 mm fan costs USD 22.90/GBP 19.99/EUR 23.50.